These noodles are becoming increasingly popular as a low-carb, ketogenic pasta replacement, but what is the story behind these keto-friendly noodles? Shirataki noodles — also known by other names like miracle noodles, glucomannan noodles, konjac noodles, or konnyaku noodles — are gelatinous and translucent traditional Japanese noodles common in Asian Cuisine. They are made from the konjac plant which is ground and shaped into various types of pasta and rice — but don’t be fooled, these noodles are completely different from the carb-laden foods that they mimic. Shirataki noodles have almost no calories and virtually no carbs, making them perfect for any diet — especially the ketogenic diet. They are 97% water, 3% fiber and have traces of protein, fat, and calcium. More specifically, there are four calories and roughly one gram of net carbs in every 100 g / 3.5 oz of shirataki noodles. The reason why the packaging may say “zero” calories or “zero carbs” is because the FDA allows products with less than five calories and/or less than 1 gram of carbs, protein, and fat to be labeled as zero. At first glance, it may seem that these noodles have no health benefits at all. However, just because they are virtually calorie and micronutrient free doesn’t mean that they don’t have other health-promoting components. Perhaps, the best thing about shirataki noodles is that they provide us with a unique type of fiber that is rarely found in westernized diets. Replacing any high-carb food like pasta with a virtually zero calorie and zero carb food like shirataki noodles will obviously have a profoundly positive impact on health, but this isn’t the only reason why we should include shirataki noodles in our diet. It has been shown to promote satiety via several mechanisms, keeping us fuller with less food for longer. By consuming it with a meal, it naturally reduces the amount of food we eat at that meal. It improves several important risk factors for heart disease, including total cholesterol, LDL cholesterol, triglycerides and fasting blood sugar. It improves gut health by feeding friendly gut bacteria. It reduces carb, fat, and protein absorption (only beneficial for people who overeat). One important caveat, however, is that glucomannan expands rapidly, and it can absorb up to 50 times its weight in water. This can help trigger satiety, but it can also cause digestive issues as well. It can cause bloating, gas, and mild diarrhea. It can reduce the bioavailability of oral medications and supplements. However, keep in mind that these are the side effects of glucomannan, not shirataki noodles. The noodles will already be saturated to some degree with water and sauce when you consume them so you probably won’t experience any of these issues. I prefer to add shirataki noodles to already nutrient-dense meals with delicious sauces. Their ability to soak up the flavor and provide a novel texture to the dish make these noodles the perfect secret ingredient. Before you head to your local grocery store and pick up shirataki noodles, it’s important to know how to incorporate them into your diet. Firstly, don’t expect these noodles to be anything like wheat flour or rice flour based noodles — Shirataki noodles have their own unique personality. Texture-wise, they’re slippery and slick, sort of like a cross between spaghetti and aloe vera gel, and they are virtually flavorless on their own. In my opinion, their texture and ability to soak up flavors add another level of enjoyment to my keto meals. If you’d like to try these noodles out for yourself, you can find them at an Asian market or a particularly well-stocked supermarket. There are many varieties of shapes and flavors — some are made only with konjac plant, others with added tofu or other proteins and carbohydrates intended to give them a specific texture that mimics more traditional noodles. I’d suggest sticking to the pure shirataki noodles — the ones that are made from the konjac plant without anything added. The brand I use the most is Miracle Noodle. They make so many varieties of shirataki noodles that you’ll easily be able to find one that works best for you. Each noodle variety can be added to the diet in many ways that can fit any lifestyle. When I am too tired to cook, for example, I’ll quickly rinse, drain, and dry the noodles and mix them with some leftover tomato sauce and meatballs (like these). This is a great way to have a quick and delicious meal in 10 min or less. You can also combine the shirataki noodles with any other sauces or curries that you like. In the mood for some Thai food? Whip up some red coconut curry and throw some noodles in. Want some noodles in your keto-friendly soup? Mix in some shirataki noodles. However, before you start experimenting, don’t forget to prepare them properly. When I first started using shirataki noodles, I dumped them straight from the bag into some tomato sauce, and it turned my delicious sauce into a slimy, slippery, and bland mess. What was I missing? I didn’t consider the fact that the shirataki noddles were already saturated with water. So, instead of soaking up the sauce, the noodles just sat there without adding anything to the dish. What I should have done was take the time to prepare the shirataki noodles for culinary perfection. On the back of the shirataki noodle packaging, you will find directions on how to prepare them. Usually, it says to rinse and drain, then to boil them and dry them on the stove. This process will help get the shirataki noodles ready to soak up all of the saucy goodness in your keto meals, but doing all of this is not necessary. As they are dry frying, separate them and turn them over with tongs (or any utensil you prefer) so that the noodles dry evenly. Toss the noodles into your prepared sauce or toss the sauce and the other ingredients into your prepared noodles, mix it all together, and serve. Bonus tip: If your noodles have an unpleasant odor, put them in a pot of boiling water for 2-3 minutes before drying them. By preparing your shirataki noodles in this way, the noodles will absorb all of the delicious flavors you want in every bite while reducing the sliminess of the noodles. But don’t fool yourself, these will not taste or feel the same as other types of pasta. In fact, when they are prepared correctly, they may become your favorite type of noodle. If you are looking to have some creamy, savory, and cheesy deliciousness with your pasta, then this keto recipe is for you. 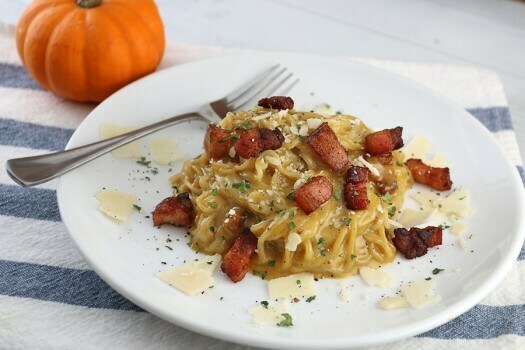 It combines pancetta and sage to provide your palate with different levels of flavor while the pumpkin adds a creamy texture with a hint of sweetness. This dish tastes so good that it is one of my favorite ways to prepare shirataki noodles. What’s even better is that it comes with many health benefits as well. The pumpkin puree alone will meet your daily needs for vitamin A — a vitamin that is essential for skin, bone, and eye health. The egg yolks also provide us with thirteen essential vitamins and minerals and the eye-protecting antioxidants known as lutein and zeaxanthin. On top of that, the cheese, butter, and heavy cream in this recipe contain a fatty acid called conjugated linoleic acid, which has been found to promote fat loss. Altogether, this recipe is packed with flavor and health benefits that you will rarely find in other keto recipes. This recipe can also easily be adjusted to meet your macronutrient needs. For example, if you need more fat and protein, add some extra parmesan and pancetta on top. To up the fat content without increasing the protein too much, consider adding an extra egg yolk and/or a tablespoon of butter or MCT oil. Thai food is a flavor journey that every palate should embark on. However, most of the specialty Thai dishes are carb-based. So, what do you do when you want to tantalize your taste buds without the carbs? Make it yourself by using shirataki noodles instead of rice or wheat-based noodles. In fact, by using the shirataki noodles, you can make this dish even healthier without missing out on any of your favorite Thai flavors. The keto-friendly pad thai sauce combines the sweet and sour flavors of different types of citrus with the garlic, peanut butter, and a little bit of spice. This combination may seem weird at first for a westernized palate, but don’t knock it before you try it. 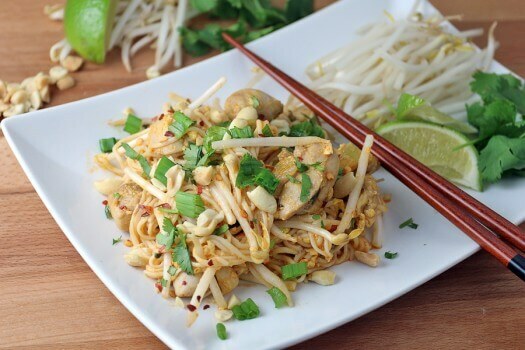 When you have the pad thai sauce with the noodles, chicken, eggs, mung bean sprouts, and chopped peanuts, you’ll be wanting to make more after the first bite. As an added bonus, you’ll get many health benefits from indulging in these Thai flavors as well. The garlic and green onions, for example, contain a compound called allicin, which activates anti-inflammatory and anti-oxidative activities throughout the body that protects us from brain damage and disease. On top of that, you will reap the benefits of eating chicken, eggs, and mung bean sprouts, which are all excellent sources of b-vitamins, essential minerals, and protein. With all of these healthy ingredients, it is hard to tell what is more profound in this keto pad thai dish — the flavor or the health-promoting benefits. Adjusting this recipe to meet your macros is simple as well. Need more protein? Cook up some extra chicken thigh meat. Want extra fat without any protein? Add a tablespoon or two of coconut oil or MCT oil. Shirataki noodles are a versatile keto-friendly ingredient that will curb your cravings for pasta and rice. Although these noodles will not mimic the properties of traditional rice and pasta varieties, you may enjoy much more because of their unique texture and ability to soak up all the delicious flavors in your favorite sauces when prepared correctly. Once you’ve prepared the shirataki noodles, feel free to toss them into any of your favorite sauces and add some meat and cheese on top for extra protein and fat. 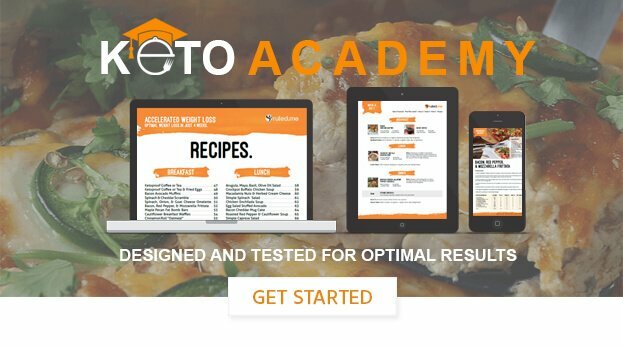 If you would rather follow a keto-friendly noodle recipe instead, try making some keto chicken pad thai or keto pumpkin carbonara. These dishes cover such a diverse range of flavors and textures that you’ll never get bored of them. 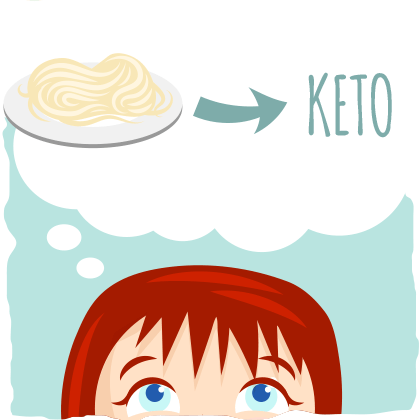 Whether you follow recipes or experiment with them on your own, shirataki noodles are a great addition to the keto diet that can improve your health on many levels. Try them out for yourself — you might be pleasantly surprised.